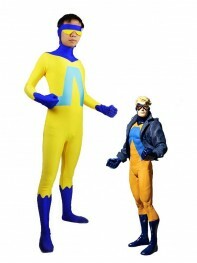 Animal Man (Bernhard "Buddy" Baker) is a fictional character, a superhero in the DC Comics Universe. As a result of being in proximity to an exploding extraterrestrial spaceship, Buddy Baker acquires the ability to temporarily “borrow” the abilities of animals (such as a bird's flight or the proportionate strength of an ant). Using these powers, Baker fights crime as the costumed superhero Animal Man.